Where pets reside, odors may also exist in abundance. Any pet habitat not cleaned frequently -- including your entire home, if the pet roams freely -- equates to pet hairs, accidents or even forgotten spoiled food raising a stink, literally. Keep funky, foul odors under control by dealing with the smells as soon as you notice them. Ideally, work immediately to solve problems with pet-produced odor. Blot up urine from floors, furniture and carpets right away using folded paper towels. For upholstered surfaces that are able to withstand additional moisture, blot up as much moisture as possible, then press a damp cloth or sponge over the spot to help dilute the urine, which also reduces the odor. Blot the area as dry as possible with paper towels or an absorbent white cloth. For other messes, scoop or pick up the substance with paper towels while wearing rubber gloves. Wipe washable surfaces down and upholstery with water and a gentle dish soap, then wipe again with a damp cloth. Baking soda sprinkled over soiled areas absorbs lingering odors. Brush or vacuum the baking soda away after several hours. If fur-laden pets share your favorite upholstered furniture, their fur-based odors share the space with you as well. Pet hair and dander settles on the upholstery and between cushions, causing unpleasant odors. Remove all pillows and cushions and vacuum them thoroughly, vacuuming the furniture from top to bottom as well. If your pet sheds a lot, tip chairs or couches on their sides to vacuum stray hair stuck to the bottom of the furniture or settled on the floor. 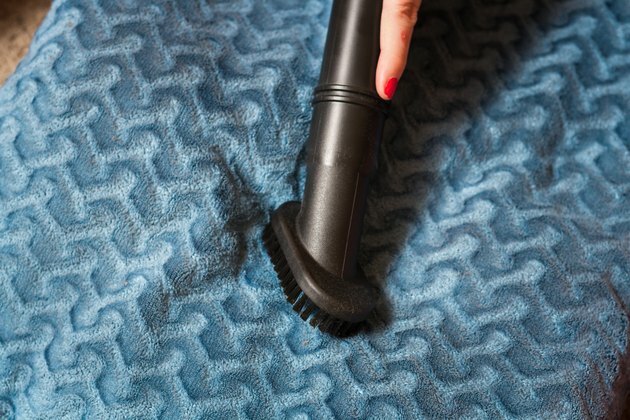 Vacuum carpeting, rugs and pet beds to remove trapped pet hair and dander as well. Replace vacuum bags frequently or empty the chamber designed to catch vacuumed materials, otherwise the vacuum cleaner itself may emit pet-like odors. To remove lingering odors, sprinkle the affected areas with baking soda, then vacuum it up after several hours. Vacuuming before and after the baking soda treatment helps remove the odor on two levels -- first to remove odor-causing hair and dander, then to absorb stale smells absorbed by the baking soda. Items such as blankets, pillowcases or even clothing may wind up with unpleasant pet odors. Wash the smelly items using your usual laundry detergent plus 1 cup of vinegar, following the care instructions on tags. Do not overload the washing machine, as this doesn't allow enough room for the items to move around, which means they won't get completely clean. Line-dry the washed items, if possible, or dry them following the care tag, without using fabric softeners or dryer sheets. 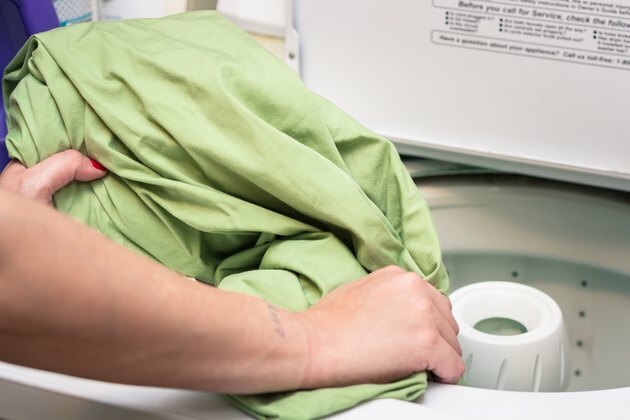 Both softeners and dryer sheets may leave behind residues that cling to fabric fibers, trapping odors and dirt in, which makes them harder to wash clean the next time you wash them. If it smells as though a pet had an accident somewhere in the room but you can't quite tell where, a battery-operated blacklight may help you find the problem. Switch the blacklight on, then turn off lights in the room. Ultraviolet light illuminates pet stains. Once you find the problem areas, apply a small amount of water to dilute the spot, then blot the moisture with a paper towel. Apply an enzymatic cleaner to spots found on synthetic fiber rugs, carpets or upholstery, following directions on the package, which may vary by brand. Test the cleaner on an inconspicuous area first to ensure it does not harm the material. 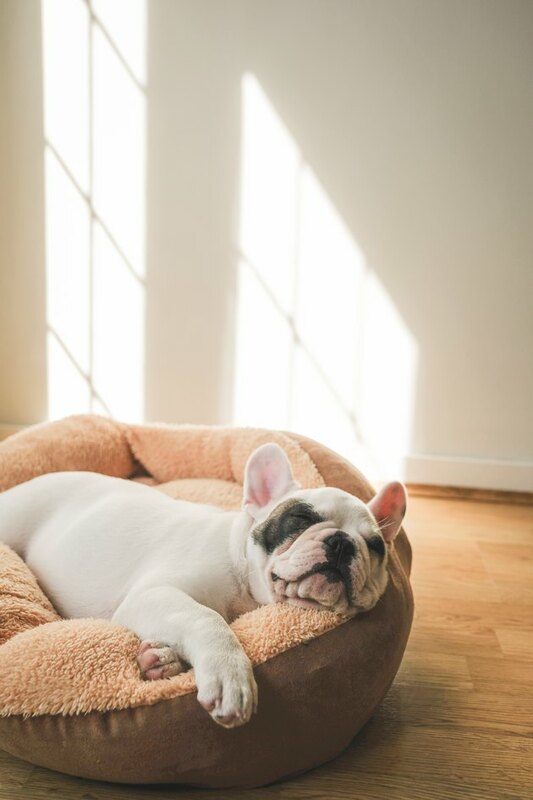 Avoid using vinegar or ammonia on the stained area, which may not mask urine smells and in fact may encourage your pet to mark the area again. Caged or contained animals such as hamsters or birds may create another vector for odors -- the cage. 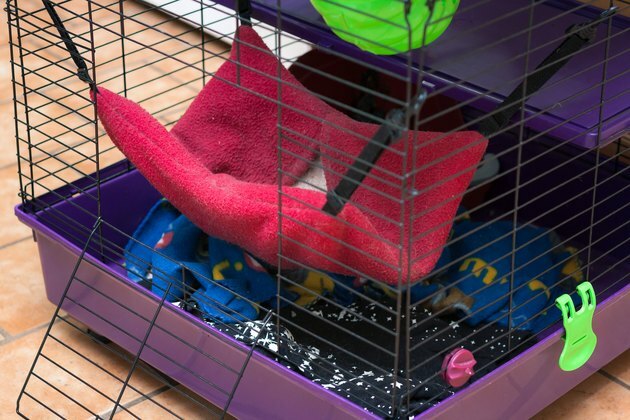 Cleaning the cage regularly with pet-safe materials prevents or greatly cuts down on the odors. Clean the pet's cage every week or two, as needed. For hamsters, gerbils and pets that use specific areas of their homes as bathrooms, remove the soiled bedding daily to keep odor to a minimum. Never clean the cage or habitat with bleach or strong chemicals, as these may be harmful to the pet. Use only gentle cleaners such as water and a mild dish soap, or cleaners specifically made for the habitat of your pet. Sometimes, pet odors are obvious the moment you walk into a room due to dander, litter boxes and the like. 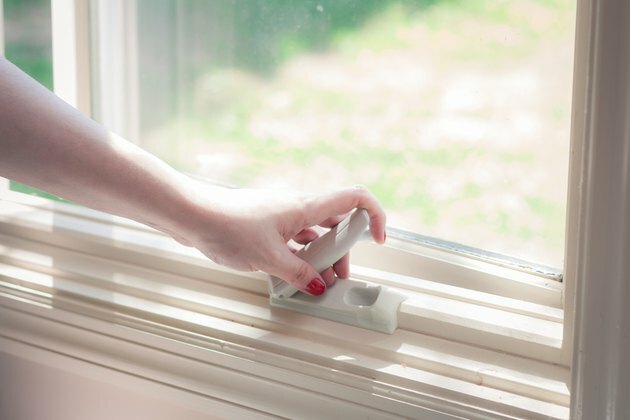 Once you've removed the actual source of the odor, freshen the air by opening windows or placing bowls of vinegar in the room, well out of reach of pets or small children, and in a place where the bowls cannot be tipped or spilled. Leave the bowls out overnight to absorb odors.